These "Kitchen Calculators" will save you time in the kitchen! 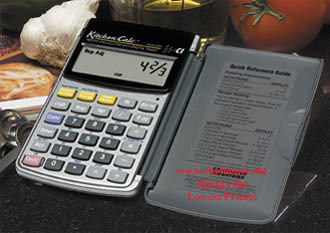 We tested these kitchen calculators and found that they really do save time and money in the kitchen. 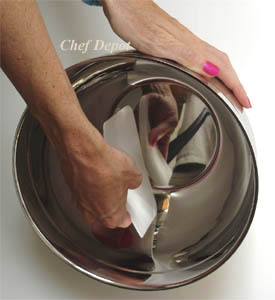 No more guessing the correct quantities or portions of your favorite recipes! We guarantee the lowest prices! These "Kitchen Calculators" will save you time in the kitchen. Now you can get professional results just like your favorite Chefs in your own kitchen. You can easily and accurately adjust recipe ingredients up or down and convert items to achieve the portions and serving sizes you desire. The Pro calculator is 6 1/2 in. wide x 6 in. deep with a 1 in. x 4 in. LCD tilting display. The Pocket calculator is 3 in. wide x 5 in deep with a 1 in. x 2 1/2 in LCD display. These kitchen calculators will easily convert all food measurements (US & Metric Measures - Liquid, Dry Ingredients, Cups, Teaspoons, Tablespoons, Weight, Volume, Decimals, Fractions, Metric, Fahrenheit, Celsius, Fractions and Decimals)! These calculators have large easy to read LCD displays. They also work with fractions or decimals. Built in digital timer with beeping alarm works even while using other functions. Built in recipe and portion size memory to store your preferred recipe and portion sizes to ensure you will get the desired quantity you want. Includes a plastic cover to protect from food spills. 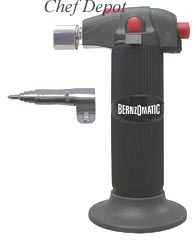 Also includes a long life lithium battery, users guide and one year warranty. 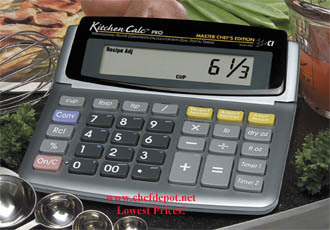 There are two sizes, the larger model has larger buttons and easily fits on the counter during use (CDKITCHENCALCPRO). The smaller model fits in your pocket (CDKITCHENCALCPOCKET). 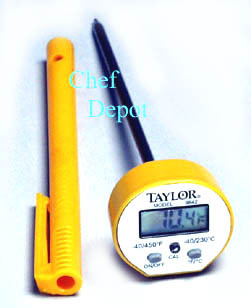 This is the new professional model Taylor digital thermometer. It reads in a second and is accurate +- 1 degree F., it's also waterproof. The digital readout is easy to see, it instantly reads from - 40 degree's Fahrenheit to 450 degree's Fahrenheit (also Celsius). It comes with an antibacterial pocket sheath for easy storage (it kills germs on contact after each use). This thermometer has an automatic off switch for long battery life. We recommend this thermometer for all Pro Chefs and home kitchen use, cooking grilled & roasted foods, microwave reheating and candy making. Click here for Chocolate, Saffron, Peppercorns, Vanilla Beans and Gourmet gifts! The highest quality at low prices! Click the green arrow on the right for Digital Thermometers and Scales!